When I was about 10 years old, another boy my age showed me how to find and grab salamanders. His family and mine were on a summer vacation in New York’s Adirondacks, where it wasn’t too uncommon to lift a fallen tree branch to send a salamander scrambling for cover. I proceeded to catch and keep them for a day or so in a shoebox lined with moist soil and cover, yet I remember only two--one because it was a beautiful bright orange; the other because it escaped, but when I had tried to grab it, its tail broke off, wiggling in my hand. I felt terrible, certain the salamander would die. I was relieved though skeptical, when someone advised me that a new tail would grow and the escaped salamander would be fine. How lizards or at least the green anole lizard (Anolis carolinensis) accomplish the feat of tail regeneration was determined less than a year ago by collaborators from Arizona State University, Translational Genomics Research Institute, Phoenix, the University of Arizona College of Medicine-Phoenix and Michigan State University. Why did they study lizards (reptiles) instead of salamanders (amphibians)? Of animals that have the ability to regenerate tails or limbs, lizards are the closest to humans; we’re both amniote vertebrates. Research on regeneration by lizards offers the best chance that what’s learned will be applicable in human limb regeneration. Tree skink lizard with lost and regenerated tail. And the differences between salamander and lizard tail regeneration are significant. Earlier work with salamanders found that regeneration is mostly at the broken tip itself and involves turning on genes that control stem cells in many organs such as the brain, hair follicles and blood vessels. In contrast, the researchers discovered that lizards turn on genes--at least 326--in only specific regions of the regenerating tail, and these include genes involved in embryonic development, hormonal signal response and wound healing. 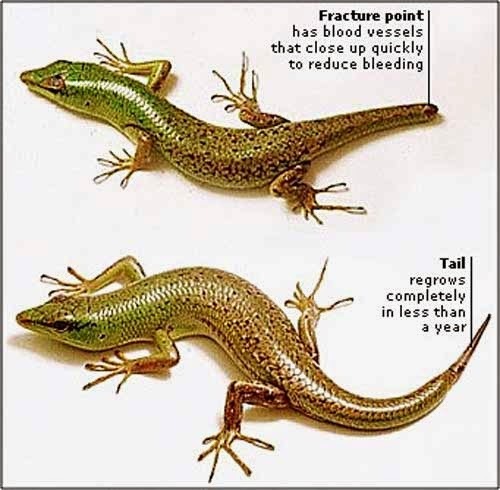 It appears that lizard tail regeneration is a pattern of tissue growth distributed throughout the tail, which may require just the right mix and amounts of genetic ingredients. The hope is that following the recipe with some of the same genes in human cells will lead to therapeutic breakthroughs for addressing human injury, birth defects or disease.